This stunning 9ct White Gold ring features contrasting diamond set and polished shoulders, that elegantly entwine up to the centre stone. When viewed from the top, an impression of a spiral can be seen from the hand which clasps the stone firmly. 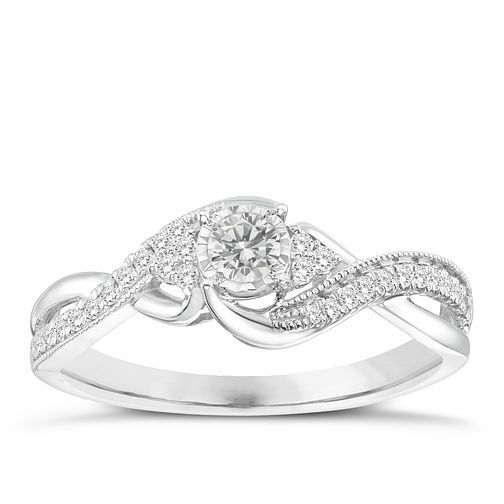 9ct White Gold 1/4ct Solitare Twist Diamond Ring is rated 5.0 out of 5 by 2. Rated 5 out of 5 by Anonymous from Absolutely gorgeous I love this ring! Got it last September & I still can't stop looking at it. It's so sparkly & shiny & I know I'm still going to love it in years to come. Can't wait to choose a wedding ring to go with it...... From Ernest Jones of course. Rated 5 out of 5 by Anonymous from So gorgeous This ring is so much more beautiful in the flesh, so to speak. A gorgeous vintage look with a stone that doesn’t stick up too much. Love it!